User warning: The following module is missing from the file system: search_api. For information about how to fix this, see the documentation page. in _drupal_trigger_error_with_delayed_logging() (line 1156 of /home/client/public_html/shiftnetwork/shift.theshiftnetwork.com/includes/bootstrap.inc). User warning: The following module is missing from the file system: search_api_autocomplete. For information about how to fix this, see the documentation page. in _drupal_trigger_error_with_delayed_logging() (line 1156 of /home/client/public_html/shiftnetwork/shift.theshiftnetwork.com/includes/bootstrap.inc). User warning: The following module is missing from the file system: search_api_page. For information about how to fix this, see the documentation page. in _drupal_trigger_error_with_delayed_logging() (line 1156 of /home/client/public_html/shiftnetwork/shift.theshiftnetwork.com/includes/bootstrap.inc). 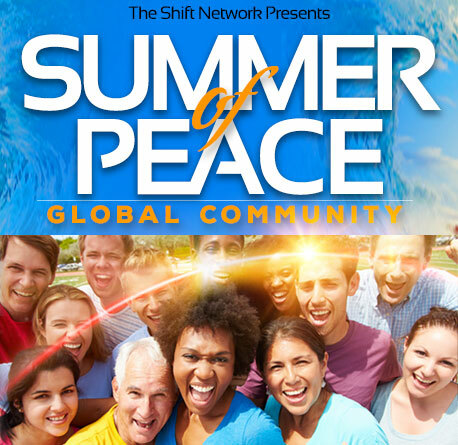 Sign up for peace updates and other announcements from The Shift Network. This summer we invite you to help ignite a world of change towards the peaceful, the inspired, and the common good. Join us for this exciting collaboration of world leaders, everyday peacebuilders, and changemakers for an array of online events, resources to bring into your daily life, and a worldwide community-building “peace challenge” to connect us and find "Inner Peace and Inspired Action." Summer of Peace Letter: A free weekly service featuring inspiring leaders in the important fields of spirituality, neuroscience, peacebuilding, compassion and peace education. Yoga Day Summit, June 21, 2018: In celebration of the United Nation’s International Day of Yoga, we’ve created a powerful online summit feature over 50+ world renown yogis, yoginis, swamis and saints. The #MeToo Dialogues, July 17-20, 2018: Discover stories of healing, brave acts of breaking silence & what’s next for the #MeToo movement during this first-ever event featuring Tarana Burke, Eve Ensler, Rosanna Arquette, Marisa Tomei, Michael Beckwith, MJ Rodriguez, Alicia Garza, Sara Ramirez, Lili Bernard, Kim Sykes, Lauren White and hosted by award-winning actress, author, and activist Tonya Pinkins™. Finding Common Ground, August 7-9, 2018: Join us peacebuilders, thought leaders, and social change agents who are helping people in polarized situations (locally and globally) find common ground. Weekly Peace Challenges brought to you by #LiveaMoment: Weekly interactive challenges through the LiveaMoment App, that will grow our globally connected community and bring more peace into your daily life. World Peace Library: This incredible resource include 425+ audio and video interviews with some of the most remarkable, inspiring peacebuilders in the world available to you for FREE. The Shift Network has identified the Northern Hemisphere’s summer – beginning on June 21, the United Nations’ International Day of Yoga and ending on September 21, the United Nations’ International Day of Peace – as a time to focus our energies for peace.? Immerse yourself in a one-of-a-kind experience with a global community of yogis – sages, musicians, scientists and beloved teachers from around the globe – to discover yoga practices, guided meditations and healing breathwork for restoring, balancing and invigorating your body, mind and soul. With more than 40 Yoga Day Summit sessions – including exclusive videos with yogis on the banks of the sacred Ganges River – you’ll enjoy an opportunity to experience and celebrate the beauty, power and depth of yoga as a vehicle for living a divine life and creating a world built on Oneness. Check out the Yoga Day Summit here! The Summer of Peace Letter (June 30 – September 20, 2018) is a free weekly service featuring inspiring leaders in the important fields of spirituality, neuroscience, peacebuilding, compassion and peace education. The letter will provide insights and skills to help you find common ground even in challenging situations – in your family, friendships, business partnerships and polarized social issues (in some cases, better understanding the obstacles to common ground). Contributing partners include: Search for Common Ground, LiveAMoment.com, US Youth Rising, Alliance for Peacebuilding, Metta Center for Nonviolence, Nonviolent Communication Academy, and many more! It’s critical that we continue to step forward and to share our stories. Join a these critical conversations – including Tarana Burke, Eve Ensler, Rosanna Arquette, Marisa Tomei, Michael Beckwith, MJ Rodriguez, Alicia Garza, Sara Ramirez, Lili Bernard, Kim Sykes, Lauren White, and many others – with host, award-winning actress, authror, and activist, Tonya Pinkins™, as they share our stories of healing, brave acts of breaking silence, and what’s next for the #MeToo movement. Discover how YOU can take inspired action through innovative solutions, the arts, and grassroots activism, plus resources to help you find your voice, reveal your story, and begin your healing journey. RSVP for The #MeToo Dialgoues here! This free 3-day summit will feature peacebuilders, thought leaders and social change agents who are helping people in polarized situations find common ground. The summit will focus on: Day One: Personal Transformation (Common Ground in Oneself), Day Two: Interpersonal Transformation (Common Ground with “the other”), and Day Three: Collective Transformation (Common Ground in the communities and world). The speakers will share powerful personal stories providing practical examples of how to find common ground! They will teach you invaluable techniques in relaxing when triggered, overcoming fear and self-doubt, cultivating compassion and forgiveness, communication skills, community peacebuilding, conscious activism and living from a place of inner resilience and Oneness. They also will provide insights into some of the more difficult realities of addressing deeply rooted societal issues and the steps you can take to help transform them. RSVP for Finding Common Ground here! What if you were calm, and I was calm, and we were calm... just for a moment? LiveaMoment is dedicated to the worldwide creation, support and funding of peace initiatives. The LiveaMoment app is a platform to connect people globally in daily moments of pause, teach emotional intelligence, and promote unity among groups. The app allows you to take a pause, identify your emotions and see how you fit in with those of others across the world. Summer of Peace partners with LiveaMoment in creating a Peace Challenge and a way to stay connected with other participants throughout the summer program.Take action, share stories, and connect towards a greater calm, all while raising funds for peace orgs around the world. Because sometimes... it just takes a moment. There’s a new narrative of peace quietly and powerfully emerging around the world – one rooted in ancient wisdom and accelerated by modern science and technology. The World Peace Library is one of the first to offer a bird’s-eye-view map of this new narrative. Designed for the layperson and professional peacebuilder alike, the World Peace Library has over 425 audio and video interviews with some of the most remarkable, inspiring peacebuilders in the world available to you at NO COST. The Shift Network’s virtual World Peace Library is the largest collection of its kind! Click through for access to hundreds of hours of inspirational, peacebuilding, compassion-spreading talks and trainings at your fingertips with this FREE global resource. There’s no way you can’t come away from the World Peace Library deeply inspired, transformed – and part of the solution. We believe advancing the emerging science and art of peacebuilding from the inner (personal) to international (collective) levels is essential to helping humanity make a shift to a just and sustainable world that works for all. Because of this, we have made a deep commitment to promoting peace education, events and collaborations in the world. Since 2010, our peace programs have have reached over 110,000 people in 141 countries. These programs provide skills training, inspirational stories, and powerful solutions from the world’s top peacebuilders, social change leaders, scientists, Indigenous elders and spiritual mentors. We seek to inspire, inform and involve people by spreading the best peace practices from around the world and encourage meaningful action in daily life. The Shift Network is partnering with a number of organizations in advancing strategic initiatives, including the International Cities of Peace in creating 1,000 Cities of Peace by 2020; Stanford University’s Center for Compassion and Altruism Research and Education in promoting global compassion education; the Alliance for Peacebuilding on countering violent extremism; and, PeaceJam and 13 Nobel Peace Laureates in promoting global peace education. Find out about how to partner with us and have your initiative become part of the Summer of Peace HERE.